In this piece, Rebecca Loncraine’s mother, Trisha, and her editor, Sophie Jonathan, introduce Skybound, which Picador are publishing posthumously this April. 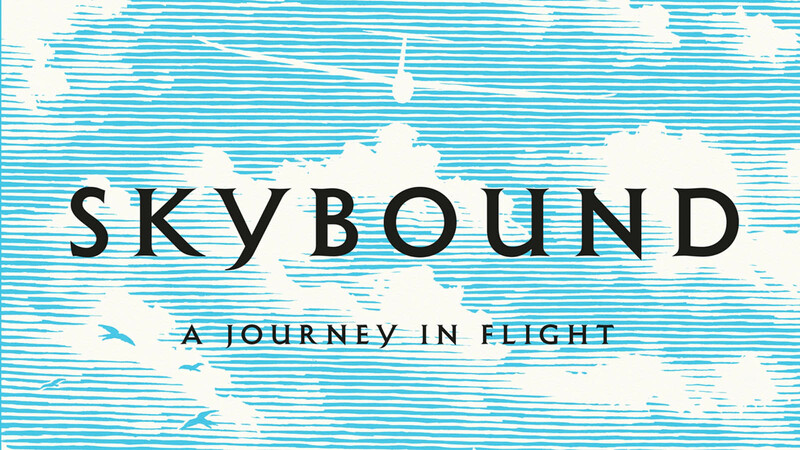 Skybound is the extraordinary story of Rebecca Loncraine, who, after battling breast cancer, overcame her lifelong fear of flying and took to the skies. In this piece Rebecca’s mother, Trisha, and her editor, Sophie Jonathan, introduce Skybound, which Picador are publishing posthumously this April. Rebecca Loncraine had been afraid of flying all her life. And then in her mid-thirties she was diagnosed with breast cancer. After months of gruelling treatment, her whole world had turned upside down: she no longer knew what scared her, only that her life had been knocked horribly off course. 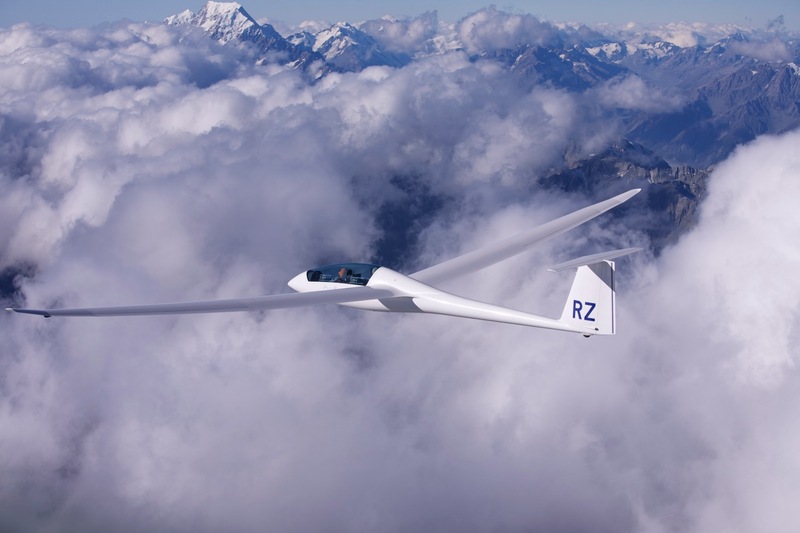 One day, whilst out walking with friends near her family farm in the Black Mountains of south Wales, Rebecca looked up to see a glider flying overhead, and she knew she wanted to give it a try – perhaps gliding would be a way to understanding herself and the world again. 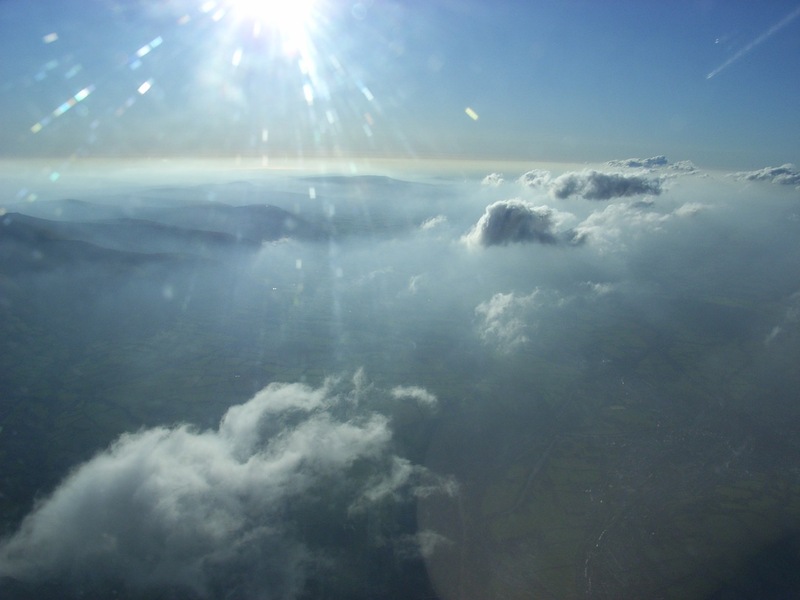 10,000 feet above the Black Mountains in Wales. Learning to fly is like asking the universe a question, asking for something; I ask it to let me go, to allow me to migrate within myself, moving over continents and seas of inner geography, to teach me to navigate both the real sky and my inner sky, with its fearful relationship with risk and control. Pilots call this the ‘human factor’: the climate outside and inside the pilot both need to be assessed before you decide to fly. Flying asks you to let your ego melt with the next cumulus cloud, to know when the sky feels like a giant mouth that will swallow you, drown you, yet hold you gently, allowing you to be played with, a cub in the mouth of a big cat. Your movements must be gentle and smooth: let the glider fly herself, leave her alone, relax, don’t grip the stick, get up close to the elements and feel your way deeper into them, go further into yourself and let go. Taught by gentle men, I am learning to be more graceful, smoother, and yet these are pilots who swear at the sky and blaspheme at the clouds. A steep turn above the Southern Alps, New Zealand. 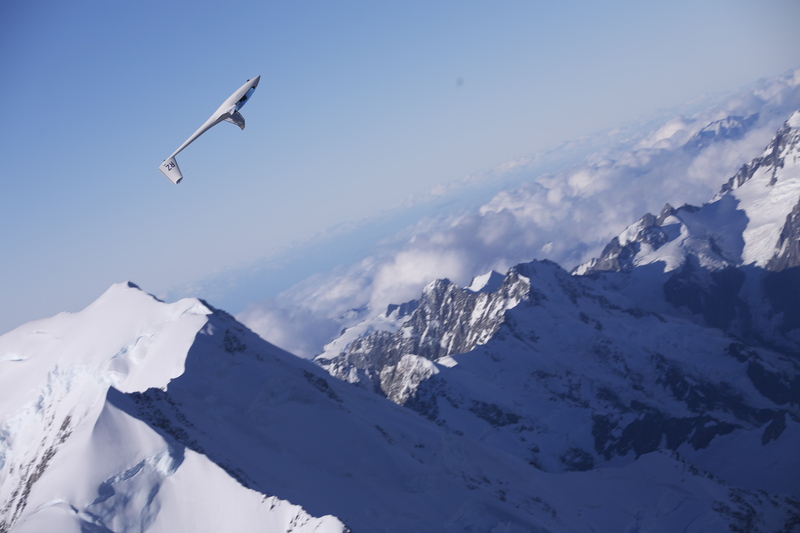 Gliding in the Southern Alps in New Zealand. 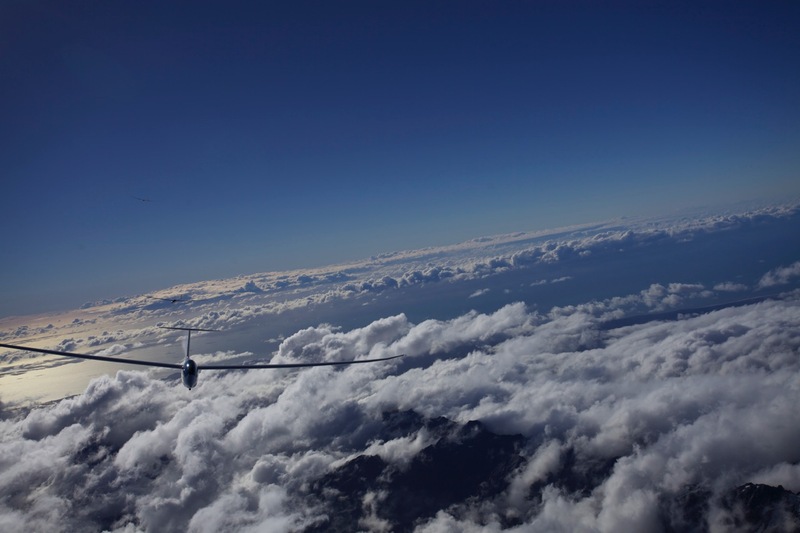 In gliding we toy with the wind, juggle with the clouds, swim, sky kayak, laugh at the rain, point at fat ponies and waving ramblers, sail through clouds, hum at hills, whistle at 3,000 feet, snoop at houses and gardens. From above, the landscape looks outstretched and in tune with itself, the rivers writing their own trails into the landscape, shaping the farms and fields, grabbing at trees. Below me is a delicate symphony – I can almost hear the shapes of this music as I fly, and the wind too is shaped by these hills, rising and falling at their behest. What does fear feel like up here when I am not sure what to do or what will happen? A tightening of the throat and legs as I peer down, not recognizing where I am. How did I get up here? How will I get back? The fear is sudden, quick as lightning, the wonder of it soon letting joy trickle through me, filling my blood with minerals, running up into my bones, filtering into my muscles, filling me with colours: yellows, oranges, golds, reds, living light filling every cell. Cloud cover around Mount Cook, New Zealand. Becoming so intimate with the elements brings you into great intimacy with nature itself. The sky can take any hurt or pain or grief and blend it with all the other pains and hurts of the world that we witness and endure, and it seems to me that the natural world can hold any hurt inside it, recognizing it, respecting it, and gently turning it over and over in its hand like a precious stone. It is as though nature holds this stone up to the light and looks deeply at it, turning it into a jewel to let the light shine through. This is what becoming immersed into the natural world and its forces can do for you and for your grief. Perhaps this is what freedom truly is. Rebecca's most terrifying flight of all. Skybound - the moving, thrilling and euphoric memoir by Rebecca Loncraine - is published in hardback and ebook on 19th April 2018.